We wake up at 8 am after a sleepless night (late evening coffee), and head to the river. It’s a beautiful day in Yangshuo, China – a small little town, nested in the mountains. The weather is nice, and the jogging gets my blood moving. Antonella is taking pictures of the river. I’m extremely tired, but our will is strong. We are enjoying a beautiful vacation day. We head back to the center, and we spot a dusty antique store. The owner is inviting, and speaks good English. We get in, and get lost in the myriad of tiny objects that are obviously from a lost era. The shopkeeper mentions some objects from ancient dynasties that go hundreds years back. I have to brush up on my knowledge of Chinese history. It sounds priceless nonetheless. Antonella and I are antique lovers. To hold an old piece in my hands, knowing it was held and treasured by countless people ahead gives me a special feeling. I am more rational than Antonella. She wants so many things. I know we are backpackers, and have limited space for extras. Besides, I traveled much before and I’m somewhat immune to tiny objects from different countries. However, I’m being patient with my friend. I glance over the artefacts, and spot some large coins. They are dusty and very old. As I get one in my hand, I see they are American dollar coins from 1800’s and 1900’s. 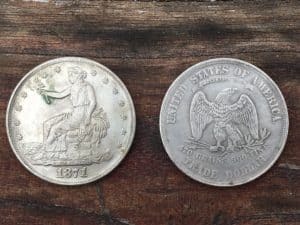 I don’t know much about coins, but one thing is clear: the dollars minted in that era were silver. They are 1 oz. dollar coins. A quick look at multiple coins confirms my suspicion: they ARE silver. 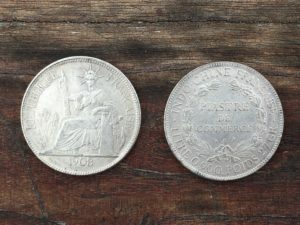 One of the coins is an 1874 “trade dollar” that is clearly marked ”420 grains 900 fine.” I’m digging in, and find a French coin saying “Piastre de commerce, Titre 0.900, Poids 27 gr.” A Mexican one mentioned “20g.” Now these are obviously silver weights and purities. I’m also finding old Chinese coins that say “7 Maces and 2 Candareens”. I don’t know what this means, it must be another measure system for silver weights. I’m feeling I’m onto something. With a poker face, I ask the shopkeeper how much he’s asking for one coin. He gives me the equivalent of about US$ 3. This guy has no clue what he’s selling. His English is limited, and doesn’t understand the markings on the coins. Possibly he can’t even read English. I’m getting excited. I know these coins are selling for much more. When I get into something, I do my due diligence. So I take pictures of the most valuable coins, especially the marked ones. I’ll do some research and come back to purchase. Antonella comes near me with great excitement in her voice. She is finding all sorts of treasures, and her hands are full. I show her the coins with the markings, and tell her they are worth much more. Antonella appreciates not just beauty but value too, so she gets on the bandwagon with me. She grabs coins from the table, and we both dig in for more. We quickly ask the price for larger quantity. The naive shopkeeper is willing to drop the price to about US$ 1.5 if we buy many. Antonella has many in her hands already. It’s ok, I’ve got better. Antonella has 29, I have 23, we are buying the store’s supply. We can’t wait to get home. I can feel we’re on the verge of something important. I’m itching to get on eBay to check the value. Back in the days, the Westerners were trading with the Chinese using these coins. They are still being found in grandma’s attic. Chinese are somehow ignorant to Western valuables, they just discard them as old metal. They have no clue what they’re holding. The Westerners like us would know. But there are so few foreign tourists in China. We barely saw any. In fact, Western tourists are probably one in a thousand. We get so many looks and giggles, that we know many have never seen people like us before. We are early travelers through China, we are obviously in privileged circumstances. Like the pioneers in the old days, we get to the gold fields first. My mind is in overdrive. My senses are excited. Everything makes sense. It’s logical that China is the last frontier. I think I must be super tired, but don’t feel it. All I can sense is the adrenaline in my veins. We shortly get to our hotel room. We spread the coins on the floor, each with her own stash. We get on eBay and start inputing the coins names and years. The Morgan silver dollar is about US$ 50, how exciting. I knew it. Sometimes it’s enough to know just a little. The French coin goes for about the same. The “trade dollar” is more expensive, about US$ 200. The Mexican reals are about US$ 50 as well. I dare to look at the Chinese coins, and it gets outrageous: about US$ 500. My head is spinning. I’m more and more convinced this could be a business like no other. I can come back to China, and scout the villages for coins. We need to go to the ATM quickly and get more money. We are staying two more days in this town, we should at least search for all the antique stores and buy all the coins we can find. I can feel the greed in me. I think of the gold diggers of the past, and can feel the rush. How could they trust each other? There must have been many murders. Thank god Antonella and I are way beyond. We will be trusted partners. Antonella is digging for information too. We both cannot contain the excitement. Antonella needs a break to cool down, she goes to the bathroom (worried I might steel her coins?!). I’m onto the next coin, 1804 American dollar which sells short of US$ 3000. I find out it’s called the Draped Bust dollar coin. The 1806 edition sells for just US$ 1000. But I have the valuable one. Wait, I have two coins, same year. I share this with Antonella, and she finds just one in her stash. I can sense her jealousy. We read about this particular coin with excitement, and quickly find out it’s the most rare American coin. Especially our edition. One even sold for 3 million dollars at an auction. Oh my god, Antonella wants me to buy her a house because I have two. We research more, more information is needed. 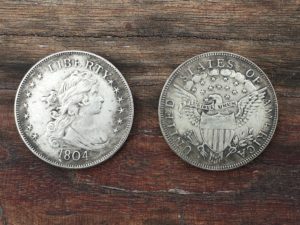 A counterfeit coin article pops up. It says it’s big business, especially with American silver dollars. And we have three Draped Busts. Three ultra rare coins under the same roof…?! I keep reading. China especially flooded the market with fake collectors’ coins. Chinese got experts at coin counterfeits, that it’s very difficult to spot the fake. There are large operations, and we find pictures of such operations. Not only coins, but all sorts of antiquities as well, from any dynastic time. They have mastered the art of making alloys imitating silver for at least 1500 years. It’s an old-time art. Making the artifacts look old, uneven, and dusty is not a biggie. I’m cooling down. We keep reading and laughing hard, our bellies hurt. Our vision of a grand business shatters. From highs to lows. I read about more Chinese coin counterfeits. 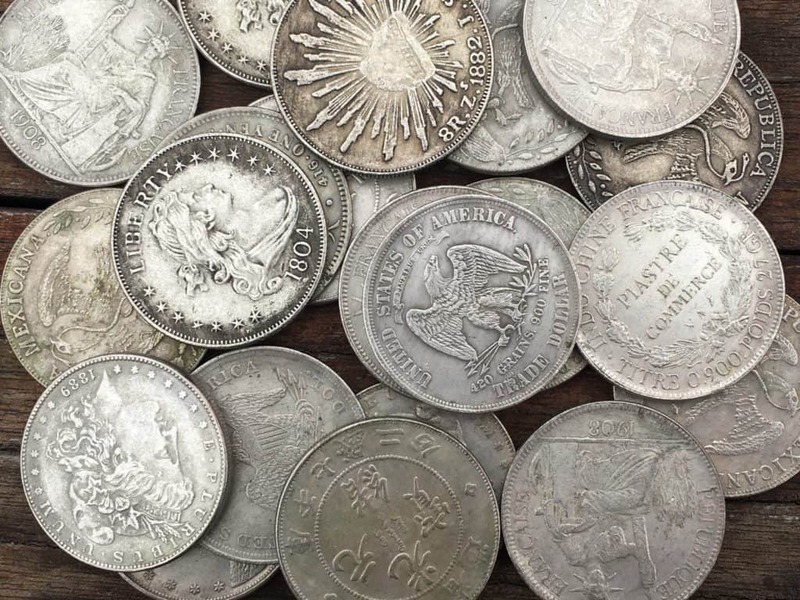 The U.S. Mint bought back destroyed American coins that came in via China, some types of coins in larger quantities than had ever been manufactured (click here to read the article). I feel better. At least I’m not the only fool. I go take a shower and burst into laughing again by myself. It’s hilarious, and a little more. I suspect the laughter is a stress release as well. I walk with Antonella to get some food, and ask her “Don’t you have a sense of emptiness, as if you lost faith in humanity?” She says “yes,” with a blank look on her face. I have a necklace around my neck that I bought yesterday. Coral fossils. It’s beautiful. Antonella is a geologist and had assured me it was real, somehow I am now in doubt. I am not believing anything right now. I remove it from my neck, as if I need to push away a foreign object. I cannot trust it’s a coral fossil indeed. I cannot trust in anything I see. It downs on us the coconut milk we have in smoothies is from a CAN. How about the rice on the street? Would I be able to spot the fake one?! I go back home and take a nap. Nothing restores me better than a good sleep. I wake up and laugh again. I put the necklace back around my neck, as if I regained some faith. Fake or not, it looks good. We go out and laugh some more. 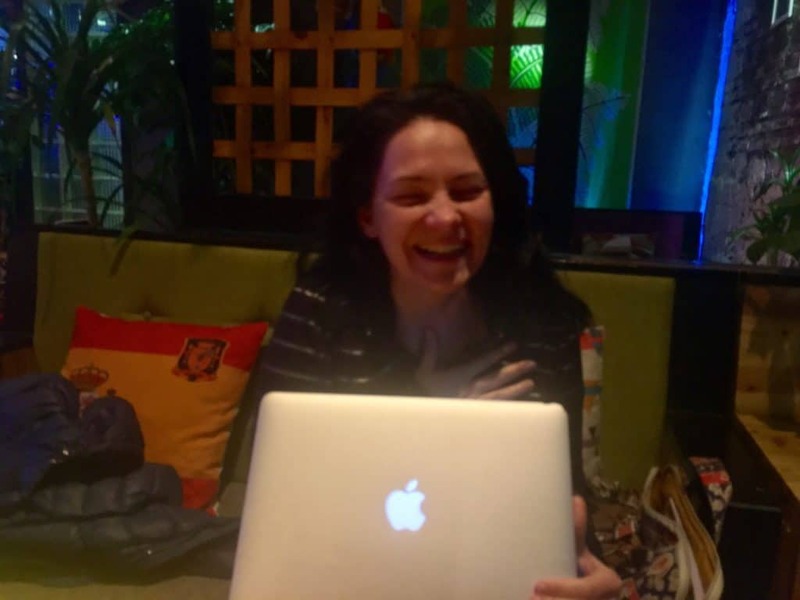 In fact, I’m laughing as I write. I’m checking the article again, and keep laughing. The US$ 30 I spent on the coins are the best investment in laugh therapy. P.S. We got back the money after we returned the fake coins. I did keep three of the most “valuable” ones.